Happy Saturday...Another lovely DIY project today, a Fabric Covered Faux Nail-head Trim Cork Board! If you're here for my Weekend Bloggy Reading link party, I hope you'll pop over to link up and browse the projects, but not before you check out today's fabulous guest post from Chelsea at two twenty one. Please leave Chelsea some comment love today! I met her in June at the Atlanta Haven Conference and she just oozes style and creativity. She is also absolutely hilarious. Hey, Serenity Now readers! 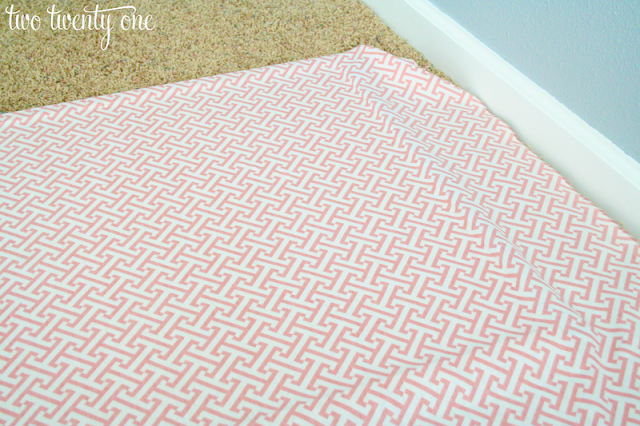 I'm Chelsea from Two Twenty One, where I share my latest home improvement projects, furniture makeovers, crafts, recipes, home decor and season decor ideas. 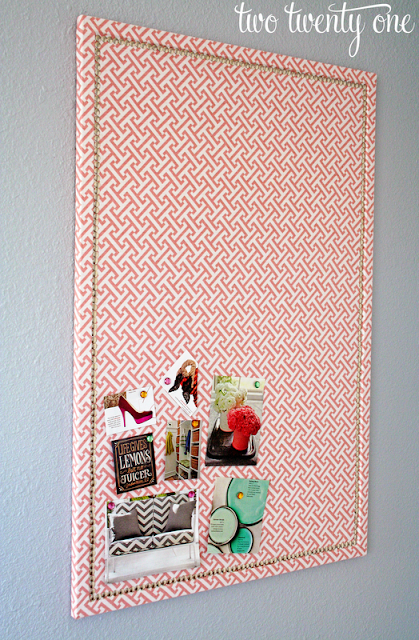 I'm stopping by to share my fabric covered faux nail head trimmed cork board with you. Get. Excited. I hope you enjoyed this fun, easy, and cheap tutorial! Thanks, for having me, Amanda! I hope you're having a blast on vacation! Thanks, Chelsea! I was so blessed to meet you in Atlanta, and can't wait to catch up at Haven 2013! Please run, don't walk, over to two twenty one, where every one of Chelsea's beautifully photographed projects and posts are sure to inspire you! I'm on my way home from Myrtle Beach today, so I'm hoping to have a fantastic round-up of Features to share with you all tomorrow. Until then, be sure to link up, and you could be one of them! This turned out so well. 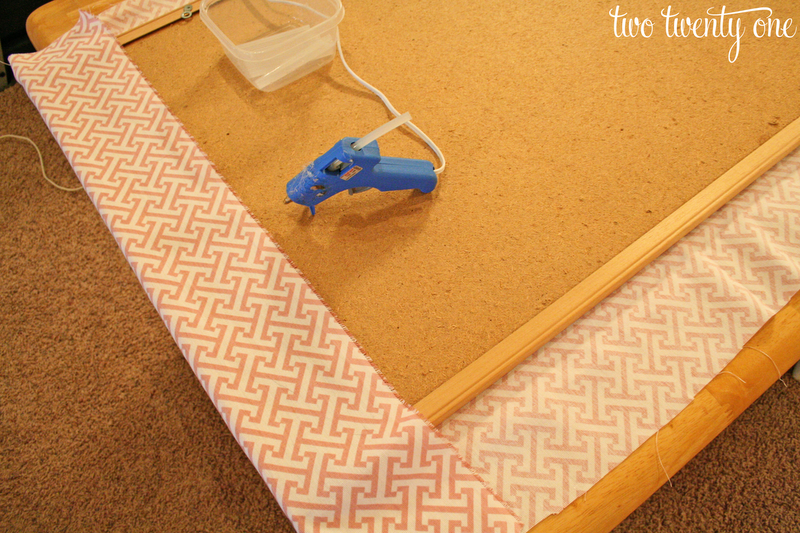 Love the fabric you used and the idea to use thumbtacks. Go, Chelsea. So cute! I love the idea of covering the frame also. I may have to use this idea on my old cork board. Thanks for having me, Amanda! Safe travels home! WOW! That looks great! Very nice project! how adorable! the fabric is perfect!! and such a simple idea with the thumbtacks! Love this! Great job Chelsea! 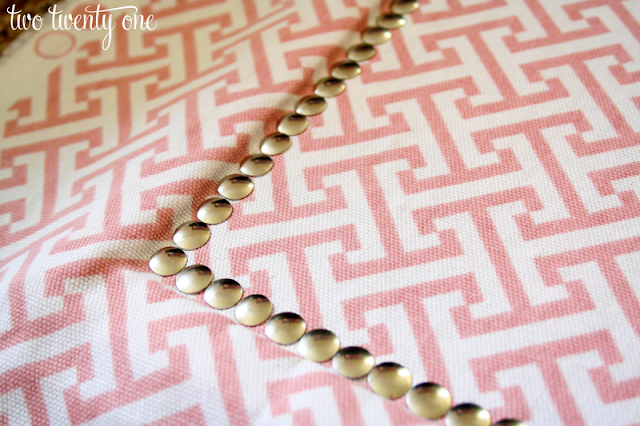 I love the idea of using upholstery nails! It realley makes the difference!